Unique cat names add a little pizzazz to your feline head of household. We’ve compiled some great lists below. One of the fun things to do when you get a new kitten or cat is to involve your children in coming up with unique cat names. With the help of this guide, you and your child can choose an interesting name for your new kitty. Kids have an active imagination and will surprise you with the creative names they can come up with. 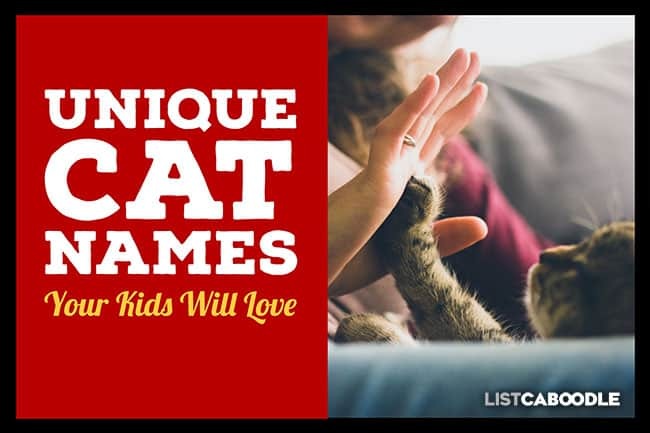 We’ve put together a list of unique cat names your kids will love. Choose one from these lists or use them as inspiration to come up with your own! Cats can hear a very similar range of sounds as humans. However, they are able to hear much higher pitched sounds—up to 1.6 octaves above the human range and even more than dogs. It is presumed that cats gained this ability to hear higher levels of sound to accommodate hunting skills, especially for small rodents. The cat’s large and movable ears allow high pitched or ultrasonic sounds to be located and amplified. Its the digital age—why not name your cat after your children’s favorite technology? Your cat will have the hippest name on the block! Ever wonder where certain products get their names? Check out this list of 17 objects that are actually trademarked brands. What are a cat’s whiskers for? A cat’s whiskers are used to “feel” just like we feel with our hands. They provide sensory input to the cat’s brain about vibrations in the air, so she can find her way through small spaces and measure distances. A cat can manuver its way through a dark room without bumping into objects by sensing with her whiskers. For this reason, you should never trim a cat’s whiskers. Doing so can disorient and frighten your cat. For even more ideas and examples of unique cat names, we’ve assembled this list of fun cat names from A to Z so you can choose the perfect name for your new kitten or cat. Check out this list of Famous TV and Movie Cats for more ideas of cool cat names! Can my cat be trained to come when called? Cats learn quickly to respond to sounds associated with rewards, like the opening of a can of food or the crinkling of a bag. You can teach them to respond to their name in a similar manner. Call the cat’s name and reinforce her behavior by providing a treat or food when she responds. You can get your cat’s attention by adding the sound of her food being opened (a sound she is already familiar with) to make the association with her name. When your cat has responded to your call from short distances, now try calling her from farther away—like from another room. You will need to be patient until she learns the association of her name to the reward of a treat. Give her time to learn. Be consistent in how you call your cat and how you reward her. Don’t punish her—cats do not respond to discipline and can backfire the learning process. Don’t over do it—keep sessions short and give her long breaks. Over time your cat will learn her name and come to you when you call! Looking for more feline fun? Check out these 10 Funny Cat Videos For Kids. Are your kids dog lovers too? Check out these Funny Dog Videos For Kids. We hope this guide has helped your in naming your new kitty. Whether you use any of the names from this list or come up with your own, you and your kids will have fun in the process!